The 8 Note Church Value Pack includes enough bells for a larger group of children and plenty of songs and accessories to get you started with both the chord and melody methods of playing. 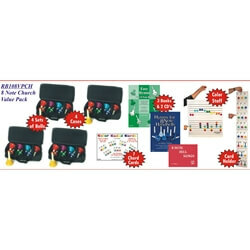 This great package includes four sets of 8 note diatonic handbells, four cases, 2 books with companion CD's and one book without CD, a 28" x 28" ColorStaff with 96 color coded circles, and a set of 7 chord cards with a card holder. The books included are "Easy Hymns for 8 Note Handbells" which can be used for both the chord and melody methods of playing, "Hymns for 8 Note Bells" which uses the melody method only, and 8 Note Bell Songs, which includes secular songs that can use either the melody or chord method of playing.